The splendid performance of the artists from Guizhou Province has added our festive atmosphere. Today is the 11th day of the first month of the lunar calendar, and according to Chinese customs we are still in Chinese New Year celebrations. I'd like to wish you all a happy Chinese New Year and a prosperous Year of the Pig. 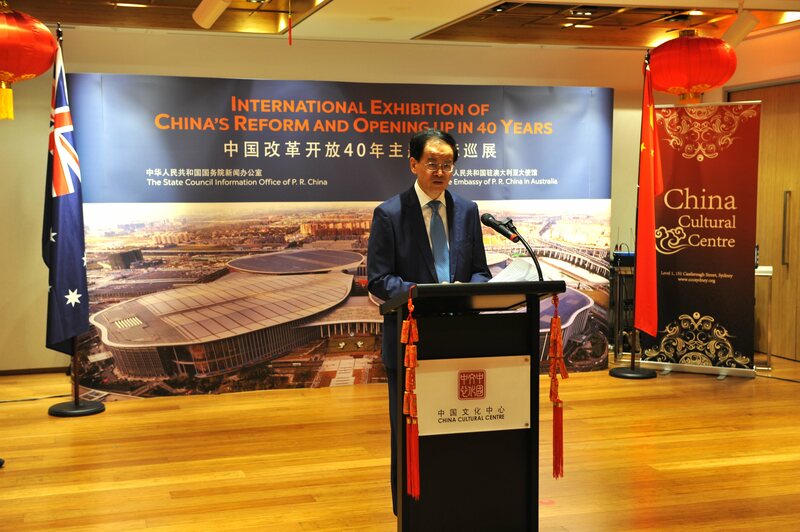 I welcome everyone to the International Exhibition of China's Reform and Opening-up in 40 Years. Over the past 40 years, China, by seizing the opportunity of globalization, has carried out steadfast reform and opening-up, integrating into the tide of world economic growth, and progressed together with the rest of the world. China has become the world's second largest economy, the largest industrial manufacturer, and the largest trader of goods, and also a main force of stability and power house underpinning world economic growth. It is my belief that after watching these vivid and precious photos, you will truly feel that 40 years of reform and opening-up have not only greatly changed China but also profoundly influenced the whole world. This year we will celebrate the 70th anniversary of the founding of the People's Republic of China, and it is also a crucial year for Chinese people to move towards building a moderately prosperous society in an all-round way. We are committed to making further headway to win the three tough battles, i.e.preventing and defusing major risks, targeted poverty elimination and pollution control. Meanwhile we will put more efforts on high-quality development. This includes deepening structural reform on the supply side, accelerating the transformation and upgrading of industrial structures, vigorously promoting scientific and technological innovation, and boosting the real economy. We will give our utmost to meet the people's needs for a better life with speedy consumption upgrades. China's development achievements have benefited from opening up to the outside world, and quality development in the future demands continuous opening-up at even higher levels. As President Xi stressed, China's door of opening-up will not be closed, and will only open even wider. We will fully implement the pre-establishment national treatment plus negative list management system, strengthen the protection of intellectual property rights, allow more sectors to implement sole proprietorships, and provide a better business environment for foreign investors. We will further deepen international cooperation. This year we are going to host the second "Belt and Road Forum for International Cooperation" and the second China International Import Expo. All countries in the world will benefit from a more open China. At present, the risk of a global economic downturn is increasing and uncertainties in the external environment are growing. However, China's economy remained within a reasonable range last year, with GDP growth of 6.6% year on year and goods import and export growth of 9.7% year on year. Optimization of the economic structure continues to gain momentum, with the service industry and consumer expenditure accounting for 60% and 76% of GDP growth respectively. The debt-to-asset ratio of enterprises has declined, the goal of eliminating the excessive production capacity of steel and coal for the past year has almost been achieved, and the environment has continued to improve. Emerging industries such as the digital economy and new energy vehicles are booming, with half of the world's top ten unicorn enterprises coming from China. At the recent Davos World Economic Forum, the World Bank and the International Monetary Fund fully acknowledged China's achievements in reform and development. The international community holds an overall optimistic view about China's economic development prospects and affirms China's role as an engine of world economic growth. At present, the China and US are making painstaking efforts to resolve their trade disputes . The reality is that the two economies of China and the US cannot live without each other. Mutual benefits and win-win is the only correct choice for both sides. Despite the uncertainties in 2019, we are confident of achieving steady economic growth in China. China remains committed to promoting all-round opening-up to the outside world and striving to create a first-class investment environment for foreign investors. It is also our hope that other countries will provide a fair, non-discriminatory, open and transparent business environment for Chinese enterprises. Competition is one of the most intrinsic characteristics of a market economy. We hope that all countries will treat and deal with market competition objectively and correctly without making unnecessary hurdles. During the 40 years of China's reform and opening-up, China-Australia relations have achieved huge progress, which really benefits the two sides. Last year, the two-way trade between China and Australia reached a new high. Although Australia has a large surplus, we believe that China-Australian relations are essentially mutually beneficial and of a win-win nature. It is my hope that in the new year, China and Australia will stick to mutual respect and enhance mutual trust, so as to deepen cooperation and bring more benefits to the two peoples.